Here, the seven greatest corn chowders. On its own, sweet summer corn is delicious. But when you add cream, something amazing happens. Here, the seven greatest corn chowders, all of which are super easy to make using this smart technique for cutting the fresh kernels off the cob. Simmering the ham rind and corn cobs in water makes a quick, tasty stock that gives the chowder a deep flavor. A dollop of spicy red pepper cream added to chowder at serving time brightens the taste of the corn without overwhelming the fresh flavor. 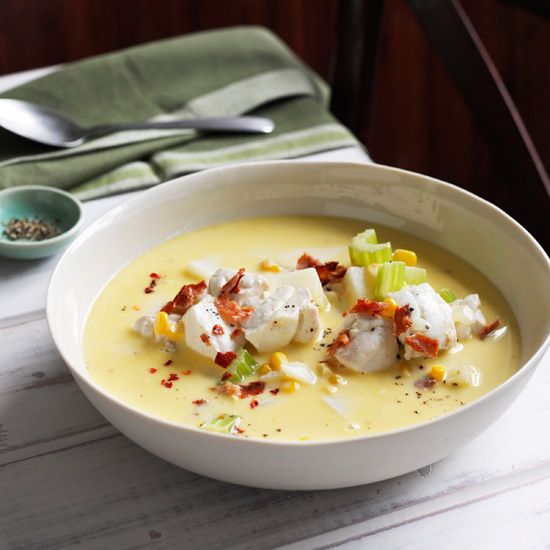 Chef Emeril Lagasse fashioned this version after traditional Southern–style corn soup, because it pairs corn with one of its very best friends—bacon. This healthful, quick dish is part soup, part salad. With its all-American ingredients, this New England–style chowder is a comfort-food classic. Instead of the traditional cubes of potato throughout the chowder, try adding a mound of creamy mashed potatoes in the center of the bowl.